Iranian President Hassan Rouhani says the Islamic Republic prevented the Takfiri terrorist group of Daesh from creating a “state” in Iraq and Syria. 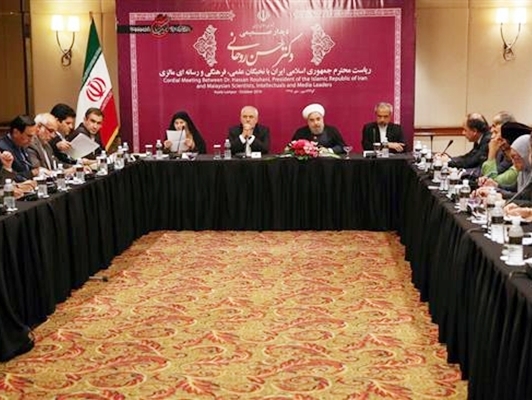 “If it were not for Iran’s assistance and role, you would not be seeing [just] a group named Daesh, [rather] you would be seeing a large Daeshstate in Syria and Iraq, and the region would be facing a big endless war,” President Rouhani said, addressing a group of Malaysian intellectuals and media people in the Malaysian capital of Kuala Lumpur on Saturday. Such a war, he said, could have even turned into an international one. The Islamic Republic has been providing advisory assistance to the militaries of Iraq and Syria in their fight against Daesh on requests from the governments of the two Arab countries. Daesh started ravaging Iraq and Syria in 2014. He said there had to be a ceasefire in Yemen and Syria and the people there had to be expeditiously supplied with humanitarian aid. The region’s geographical borders must stay the same, President Rouhani said, adding that the disintegration of countries is dangerous and can compound problems and fan regional wars. “Governments cannot be selected for the people of the region from outside, and anyone who assumes power through people’s vote should be respected by all,” he said. The Iranian president also warned against attempts to cause sectarian rifts between Shias and Sunnis. Rouhani is on a three-leg tour of Southeast Asia, which started out in Vietnam and will finally take him to Thailand. Separately, the Iranian president had met with Tan Sri Pandikar Amin Mulia, the current speaker of the Dewan Rakyat, the lower house of the Parliament of Malaysia. He has also met with Malaysian Prime Minister Najib Razak.